If you do any baking and have a recipe that requires you to grease and flour your pan, you have probably ended up with some "flour lumps" on the bottoms of your cakes, or breads. Miracle Pan Release is just that, it is the perfect blend of the oil and flour that will not leave your baked goods with flour bottoms! Even better is the fact that you already have the ingredients at home in your pantry! If you have ever purchased Bakers Joy brand spray (contains the flour and the non stick spray together) or the Wilton's brand Cake Release then you know how very expensive they can be! 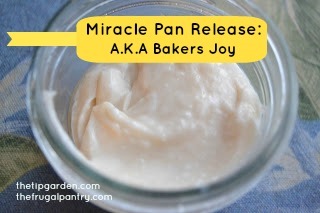 Here is a recipe for making your own Miracle Pan Release from: veronicascornucopia.com It is so inexpensive and also really does work super well with your baking, you will never go back to purchasing it or shaking loose flour around a greased pan again! This would make a very nice and thrifty gift for your favorite baker along with a mix in a jar for brownies or cake. Jan's Tip: You can make it in any amount, just use equal amounts of all 3 ingredients. I made half of the recipe below and will have plenty for a long time, since I don't bake often.